I really love how it turned out! I hope you will like it as much as I do! 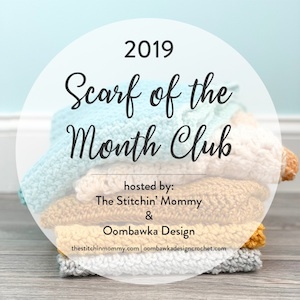 It might look complicated, but after you learn the post stitches involved, you’ll see that it’s quite easy! There are only 2 rounds repeat to complete a cable! The hat is started with the ribbing worked in rows sideways; then continued in rounds from bottom to the top. - back bump of chains: Click here for my picture tutorial. 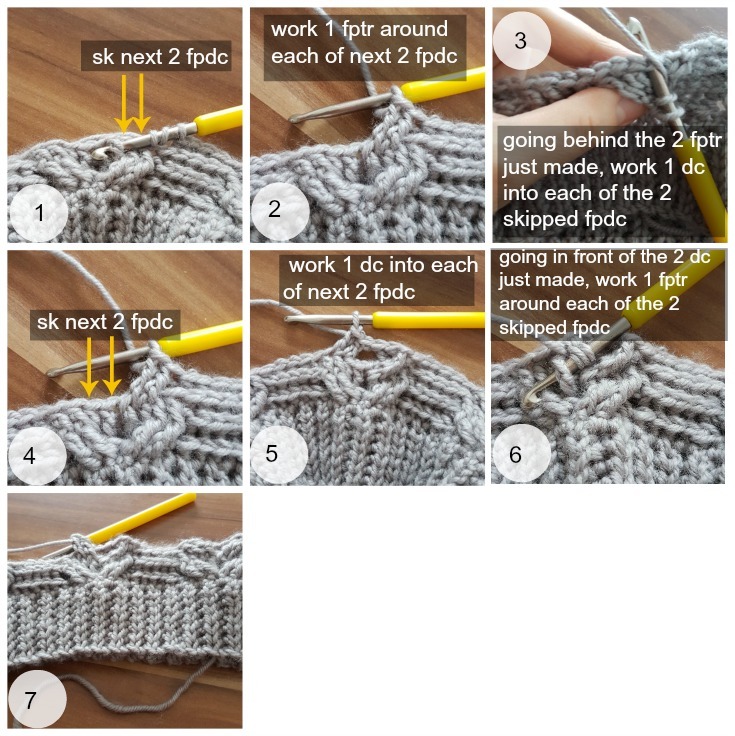 - fpdc: front post double crochet: Yo, insert your hook from front to back to front around the post of the next stitch, yo, pull up a loop, yo, pull thru 2 loops on your hook, yo, pull thru remaining two loops on your hook. 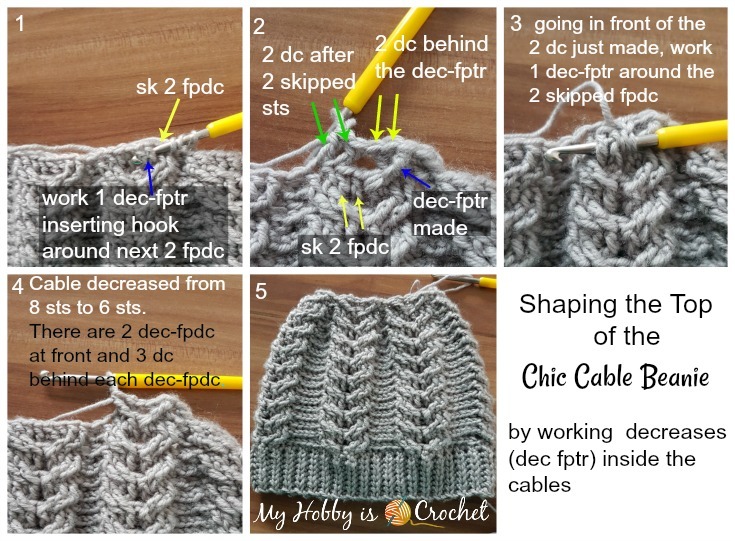 -dec-fpdc: (Invisible) decrease front post double crochet: Yo, insert your hook from front to back to front around the post of both next 2 sts, yo, pull up a loop, yo, pull thru 2 loops on your hook, yo, pull thru remaining two loops on your hook. See this Video Tutorial by Woolpedia! 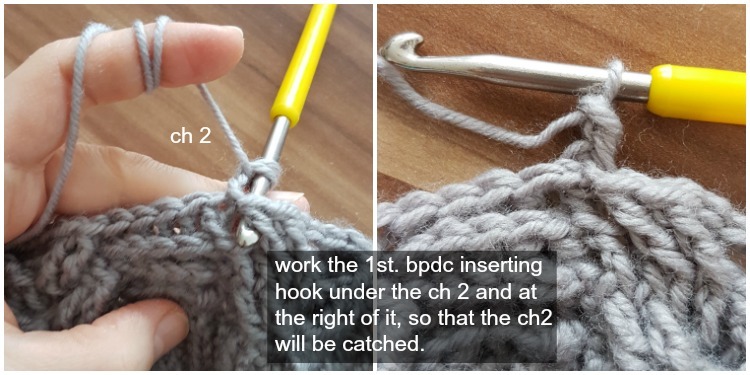 - bpdc: back post double crochet: Yo, insert your hook from back to front to back around the post of the next stitch, yo, pull up a loop, yo, pull thru 2 loops on your hook, yo, pull thru remaining two loops on your hook. 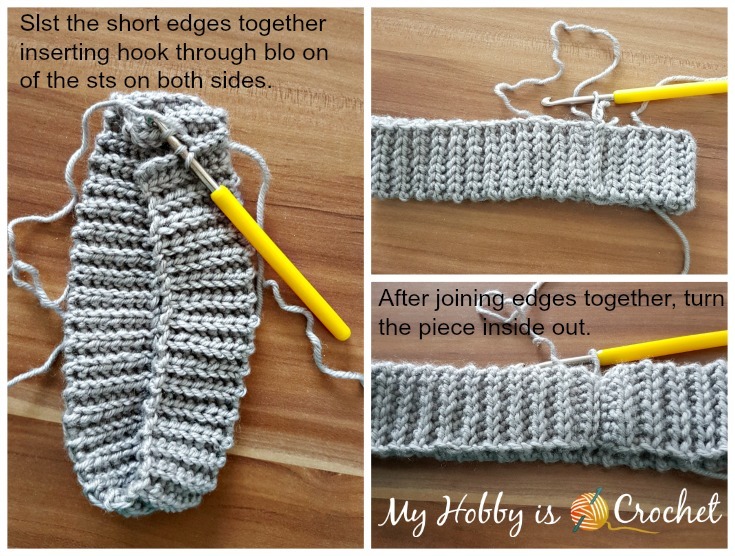 dec-bpdc: (Invisible) decrease back post double crochet: Yo, insert your hook from back to front to back around the post of both next 2 sts, yo, pull up a loop, yo, pull thru 2 loops on your hook, yo, pull thru remaining two loops on your hook. 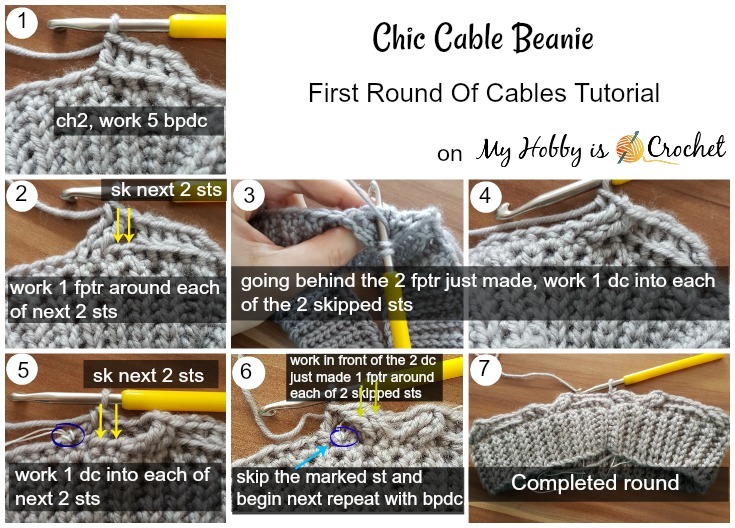 - fptr: front post triple crochet: Yo 2 times, insert hook from front to back to front around the post of the next stitch, yo, pull up a loop, (yo, pull thru 2 loops on your hook) 3 times. 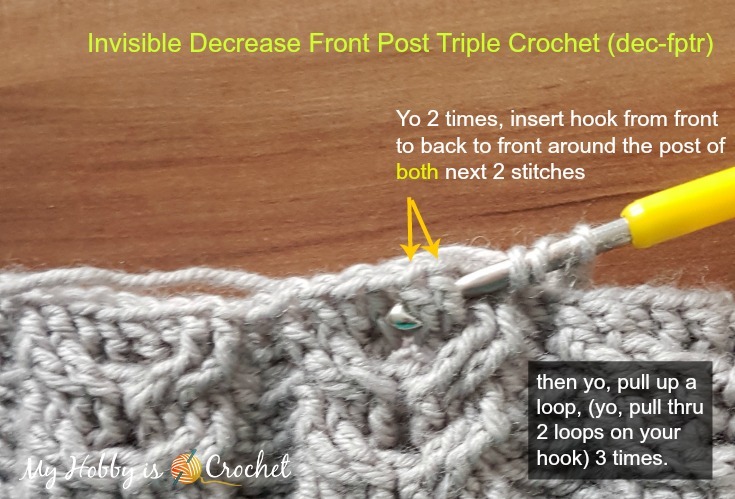 - dec-fptr: (Invisible) decrease front post triple crochet: Yo 2 times, insert hook from front to back to front around the post of both next 2 stitches, yo, pull up a loop, (yo, pull thru 2 loops on your hook) 3 times. yo-slst:Yarn Over Slip Stitch : Yarn over (yo) and insert the hook into 2nd chain from hook; yarn over and draw the yarn through the chain (You have now 3 loops on the hook). Having the 3 loops on hook, pull/slip the first loop on hook through the next 2 loops on hook to complete a Yarn Over Slip Stitch (yo-slst). Click here for my PICTURE TUTORIAL! yo-slst-blo: yarn over slip stitch back loops only: work the stitch as described above, but inserting the hook only into the back loops of the stitches. 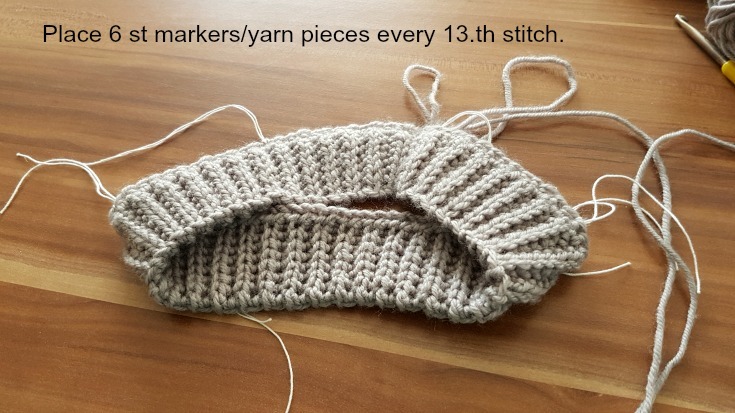 The ribbing pattern is written for toddler size with changes in parenthesis for child and adult size. Row 1: Working entire row into back bump of chains, crochet 1 yo-slst into 2nd ch from hook and 1 yo-slst into each ch across; ch 1, turn. Row 2: yo-slst blo in each of next 5 sts (6 sts, 7 sts), 1 yo-sl st using both top loops of the last st.
To avoid loops at the edge, the last stitch of each row will be worked using both top loops. Do not cut yarn! Continue with the Seam! SEAM: Fold the piece into half, hold Row 1 edge above the last row edge. Chain 1 and slip stitch the short sides together inserting the hook through the back loops of the stitches on both sides; ch1 and turn the piece inside out, so that the seam will be hidden on the wrong side. Note: Join the edges in a way that will make the V-like rib stitches to stay up after turning the piece inside out. Continue working the Body of Hat on the right side. From here the pattern is written individually for each size! Round 1: ch1, work around the edge 66 yo-slsts evenly placed ( working one st into each rib st and one st into each “valley” st on the edge); join into round with slst to top of first yo-slst. Place 6 stitch markers or yarn pieces into each 11. St around. Placing stitch markers will help when working the cable pattern to not work into marked stitches 2 times! You will understand what I mean while you work! Round 2 ( see note below): ch2, *work 1 bpdc around each of next 3 sts, sk next 2 sts, work 1 fptr around each of next 2 sts, going behind the 2 fptr just made, work 1 dc into each of 2 skipped sts, sk next 2 sts, work 1 dc into each of next 2 sts (NOTE: the 2nd dc st will be worked into the marked st! When working the next repeat do not work the next bpdc into the marked st! )going in front of the 2 dc sts just made, work 1 fptr around each of 2 skipped sts* , repeat from *to * around 6 times, slst to top of first bpdc. Note: Beginning with round 2, you will "hide" the starting ch2, by working the 1st bpdc inserting the hook & under and at the right of the ch2, so that to catch it. You can now remove the st markers. Round 5: (Note: This round you’ll decrease each cable from 6 sts to 4 sts! Cut yarn leaving a long tail that will be used to close the hole on top of the hat. 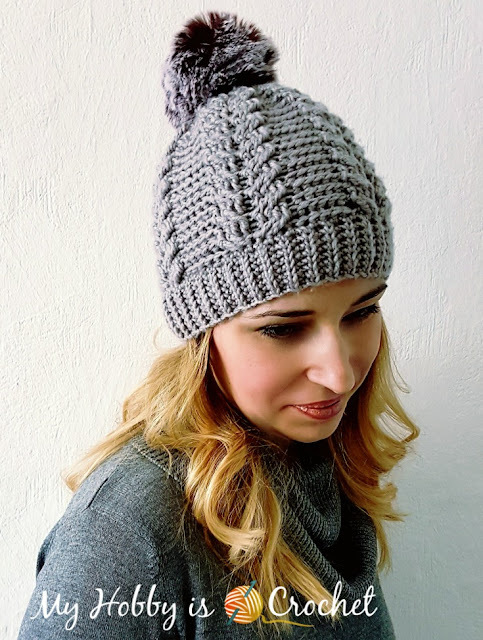 Turn the hat inside out, thread needle with the long yarn tail and weave yarn through ends of last round; pull the yarn tight to close the hole. Secure by weaving the yarn through for a few more times, then fasten off! Round 1: ch1, work around the edge 72 yo-slsts evenly placed ( working one st into each rib st and one st into each “valley” st on the edge); join into round with slst to top of first yo-slst. Place 6 stitch markers or yarn pieces into each 12. St around. ( See the picture tutorial for the adult size below). Placing stitch markers will help when working the cable pattern to not work into marked stitches 2 times! You will understand what I mean while you work! Round 2: ch2, *work 1 bpdc around each of next 4 sts, sk next 2 sts, work 1 fptr around each of next 2 sts, going behind the 2 fptr just made, work 1 dc into each of 2 skipped sts, sk next 2 unworked sts, work 1 dc into each of next 2 sts (NOTE: the 2nd dc st will be worked into the marked st! When working the next repeat do not work the next bpdc into the marked st! ); going in front of the 2 dc sts just made, work 1 fptr around each of 2 skipped sts* , repeat from *to * around 6 times, slst to top of first bpdc. You should have started the 7.th cable in height and the piece should measure 15 cm in height including the ribbing. ch 2, *work 1bpdc around next bpdc, 1 dec-bpdc around next 2 bpdc, sk next 2 fpdc, work 1 fptr around each of next 2 fpdc; going behind the 2 fptr just made, work 1 dc into each of the 2 skipped fpdc, sk next 2 fpdc, work 1 dc into each of next 2 fpdc; going in front of the 2 dc just made, work 1 fptr around each of the 2 skipped fpdc, repeat from * around, sl st to top of first bpdc of round. Round 6: (Note: This round you’ll decrease each cable from 6 sts to 4 sts! Round 1: ch1, work around the edge 78 yo-slsts evenly placed ( working one st into each rib st and one st into each “valley” st on the edge); join into round with slst to top of first yo-slst. Place 6 stitch markers or yarn pieces into each 13. St around. ( See the picture tutorial below). Round 2: ch2, *work 1 bpdc around each of next 5 sts, sk next 2 sts, work 1 fptr around each of next 2 sts, going behind the 2 fptr just made, work 1 dc into each of 2 skipped sts, sk next 2 sts, work 1 dc into each of next 2 sts (NOTE: the 2nd dc st will be worked into the marked st! When working the next repeat do not work the next bpdc into the marked st! ); going in front of the 2 dc sts just made, work 1 fptr around each of 2 skipped sts* , repeat from *to * around 6 times, slst to top of first bpdc. 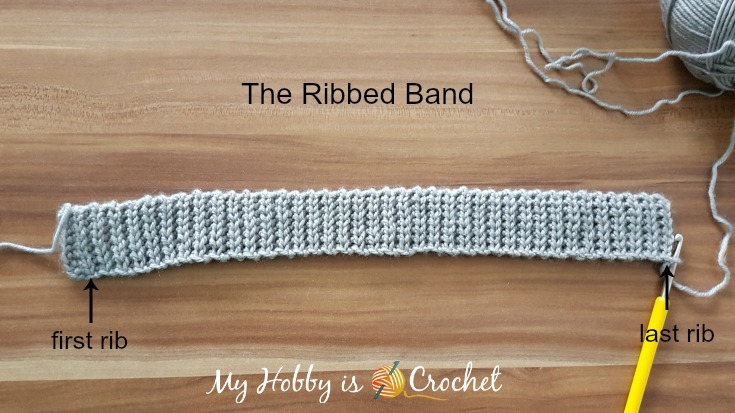 Your piece should have started the 7.th cable in height and the piece should measure 15.5 cm in height including the ribbing. All sizes: Sew a faux fur pompom or a yarn pompom made with a pom pom maker on top of your hat. 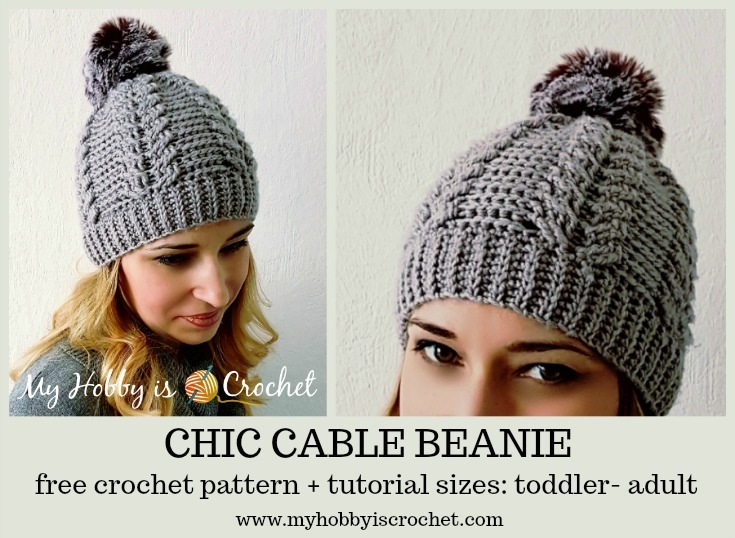 You might like the Cable Headband Easy Fit worked with the same cable pattern, but in rows! Written Instructions and Pictures COPYRIGHT © 2018 Kinga Erdem.